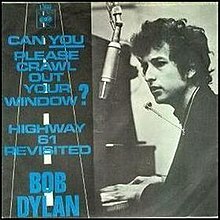 (1965) "Can You Please Crawl Out Your Window?" (1965) "One of Us Must Know (Sooner or Later)"
"Can You Please Crawl Out Your Window?" was a 1965 single by American rock artist Bob Dylan. The single, released in December of that year, reached #58 on the US Billboard Hot 100 chart and #17 on the UK chart in January 1966. Dylan is accompanied on the song by the musical group then known as the Hawks, who would back the singer on his 1966 world tour and subsequently go on to fame in their own right as The Band: Robbie Robertson (guitar), Rick Danko (bass), Richard Manuel (piano), Garth Hudson (organ), and Levon Helm (drums). Numerous takes of the song were recorded on July 30, 1965 during the sessions for the album Highway 61 Revisited with a band including Mike Bloomfield, Al Kooper and Paul Griffin; one was mistakenly issued on a false pressing of the single Positively 4th Street that autumn. The official single version, with the Hawks, is generally considered to have been recorded on November 30, 1965, although at least one Dylan scholar contends that the recording date was October 5. The entire July 1965 and October/November 1965 recording sessions were released on the 18-disc Collector's Edition of The Bootleg Series Vol. 12: The Cutting Edge 1965–1966 in 2015, while highlights from the outtakes appeared on the 2-disc and 6-disc versions of that album. Originally available as a single only, the song was eventually included (in its original mono form) on Dylan's compilations Masterpieces (1978) and Biograph (1985), and on the Band's box set A Musical History (2005). An extended stereo mix of the original single version appeared on the limited Collector's Edition of The Bootleg Series Vol. 12: The Cutting Edge 1965–1966. The song was included in Nick Hornby's book 31 Songs, published in the U.S. as Songbook. Dylan played the song to Phil Ochs as the two were riding in a limousine. When Ochs expressed a lukewarm feeling about the piece, Dylan ejected him from his limousine, yelling "You're not a folk singer. You're a journalist." Wilko Johnson recorded a version for his 1981 album "Ice on the Motorway"
The Hold Steady covered the song for the soundtrack to the Dylan quasi-biopic I'm Not There. Transvision Vamp covered the song on their third album, Little Magnets Versus the Bubble of Babble. Les Fradkin covers it in his 2006 Dylan cover album If Your Memory Serves You Well. ^ Greene, Andy (September 24, 2015). "Inside Bob Dylan's Massive New Sixties Bootleg Series Trove". Rollingstone.com. Retrieved September 25, 2015.